Happy Mothers Day, Mom! I know it is technically your birthday but I just finished your Mother’s Day gift that you saw as yarn last Thanksgiving. Oops, sorry for the delay. It is now a full scarf with tassels and everything. I just need to block it so that it can lay flat and stop curling and then it can keep your neck warm – just in time for winter. 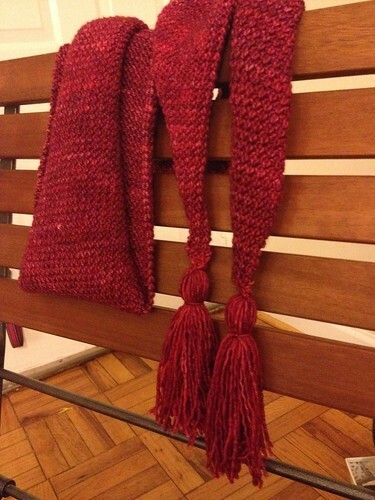 I used Purl Bee’s Grecian Rib Scarf tutorial and Madeline Tosh’s DK weight yarn in Vermillion. I like how squishy the yarn and pattern make this scarf. I didn’t like how little the needles were (size 5) which made it feel like I was getting no where on this project. I hope you enjoy it, Mom. Happy Mother’s Day and Happy Birthday (although you get that present when I see you later this week). 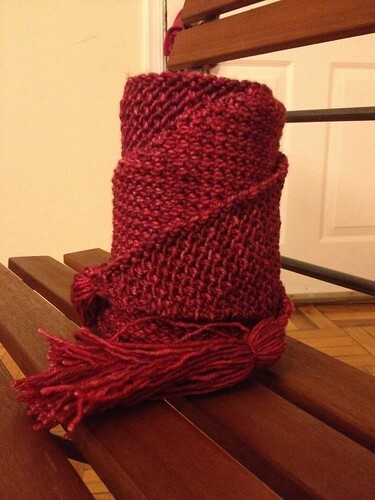 This entry was posted in Knitting and tagged Madeline Tosh, Purl Bee, Scarf. Bookmark the permalink. This turned out so pretty! The size 5 needles would have possibly caused me to abandon the project. Good job sticking with it! Thanks! You could totally do it. I can’t wait to wrap up in it. You have the stick-to-it-tiveness of your Grandma Dayton and a lot of her talent too. Thank you!!!!! I’m glad I got the “stick-to-it-tiveness!” Good made up word. Glad you like it!